The structure of the binding is a full leather flat back. 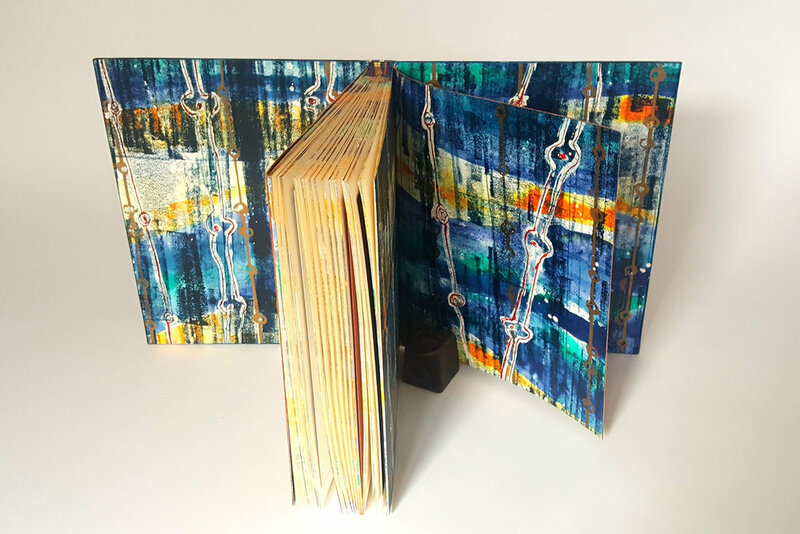 The seven sections have been sewn onto multi coloured stubs and then sewn onto tapes, with the addition of linen strips in between the tapes. There are 12 fold out samples of marble paper within the text. Each of these samples had to be protected with a cut out frame of paper which matched the thickness of the marbles to pack out the text block in order for it to be pressed safely (these were removed on completion). It has been bound with fair goat (from J. Hewit & Sons) and hand dyed using various leather dyes. The gold, vertical pattern has been blocked using a pale gold foil and then embellished with 23ct gold leaf. Foil tooled in various matt coloured foils with hand-made brass tools of dots and squares. The edges have been decorated with acrylic inks and real gold foil. Multi coloured double silk, hand sewn end-bands. 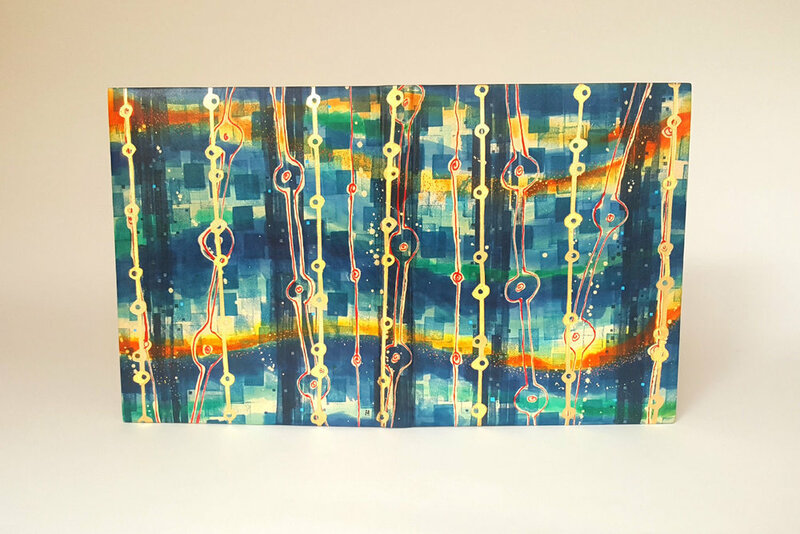 The end papers and the edge-to-edge doublures have been hand printed using acrylic inks and oil based printing inks. The flyleaves have been backed with a fine, rusty orange suede to add contrast in colour and texture. This design was driven by my client. I had instructions, not overly strict ones, for the design to resemble two of my previous design bindings; Le Grande Meaulnes and the Periodic Table. 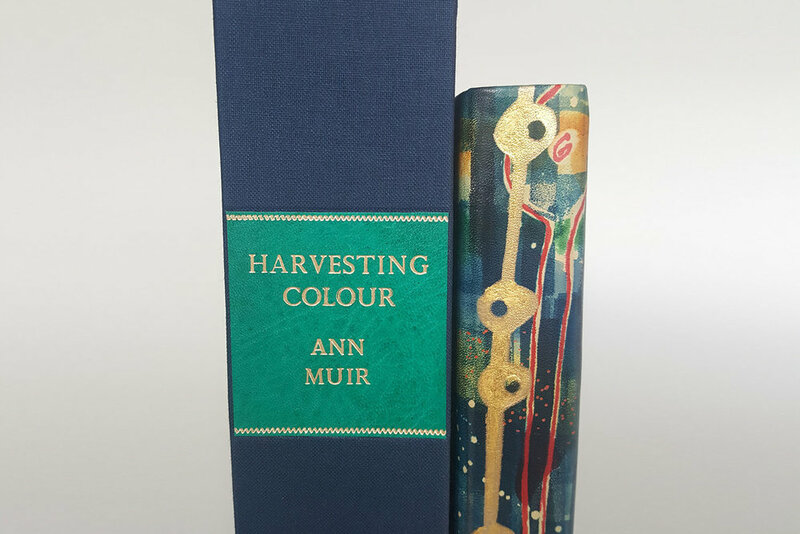 With the additional note that Ann Muir’s sense of colour and pattern should shine through. I chose 2 marble papers “April – Peacocks in Literature” for the colour and “November – Fireworks and Bonfires” for the pattern. 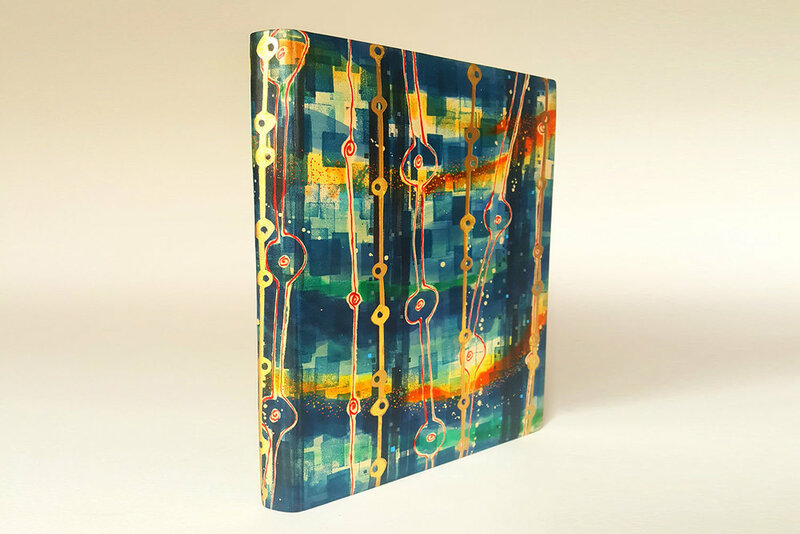 There is a lot of movement and pattern within each of these designs and I extracted a few elements from both and combined them with my design approach from the two previous bindings.